WBC World Ranked No. 1 Denver Cuello who goes by the stage name Denver Cuello Singwangcha of the Aljoe Jaro Stable will face Juan Hernandez of Mexico on March 27, 2010 in Monterrey, Nuevo Leon, Mexico, for the WBC Interim Minimumweight World Title. Cuello has a record of 19 Wins (KO 10), 2 Losses and 5 Draws while Hernandez has 16 Wins (KO 13), 1 Loss and no Draws. According to Cuello’s manager Aljoe Jaro, Hernandez is a knock-out artist who has disposed most of his opponents in the earlier rounds. However Jaro said that Denver has prepared himself well for this fight and has been very determined to add an additional world title belt for our country. The winner of this fight will face the victor of the WBC Championship bout between Oleydong Sithsamerchai of Thailand and Japan’s Yasutaka Kuroki who will face-off on the same date in Ariake Colosseum, Tokyo, Japan. Cuello is being trained by Frankie and Sol Jaro at the Jaro Boxing Stable in Binangonan, Rizal. 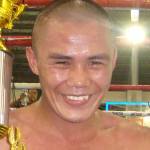 His most recent victory was via Round 1 TKO over Samuel Apuya last January 23, 2010 at the Cuneta Astrodome. Denver, his manager Aljoe Jaro, Thai promoter Naris Singwangcha and the rest of his team will leave for Mexico via California USA on March 21, 2010.